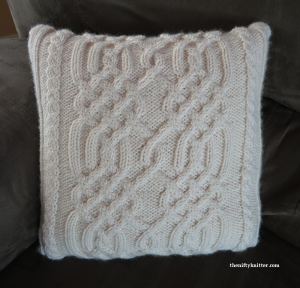 Celtic knotwork decorates the front and back of this pillow, creating a beautiful accent for any home. 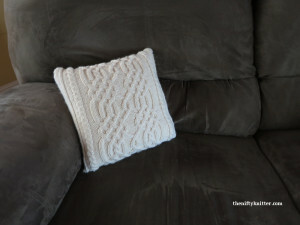 The pillow can be knit as either a removable pillow cover with a button flap closure or a fully enclosed pillow with stuffing. 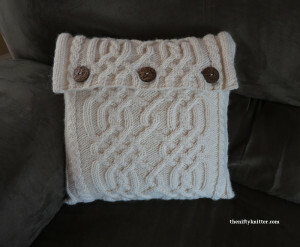 The finished dimensions are approximately 12″ by 12″ (30.5 by 30.5 cm). 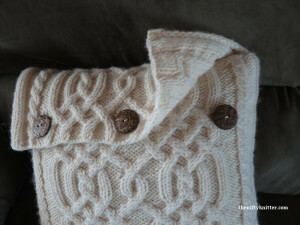 Techniques required: Cable stitches, kitchener stitch (if making a closed pillow). Approximately 250-275 yards of worsted weight yarn. 3 approximately 1 inch (25.4 mm) diameter buttons.